The founder of Malleswaram – Sri Venkatranga Iyengar, who loved riding on horse back one day visited and liked the Malleswara temple. He envisioned a locality of noblemen who would lead a rich and cultured life here. 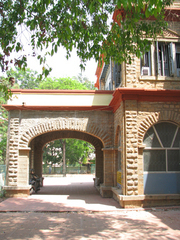 He was connected to the Bangalore's municipality and when in 1892 there was a need to expand the city, he suggested the area of Kaadu (jungle) Malleswara as a potential candidate. His suggestion was taken up, and soon the British Raj had designed and built the Malleswaram locality. Patankars (see a small part of the old house at the layout today) who are descendants of the Divans of Mysore were invited to stay here, as was Divan Sheshadri Iyer (one of the founders of IISc). Divan Krishna Murthy was also invited to live here too. These rich noblemen bought big properties of about 2-3 acres in size. This was where they chose to retire and thus, quickly Malleswaram became an area where erstwhile busy rich and civic minded people decided to spend the last years of their lives engaged in various social and cultural efforts. Two to three generations of their families lived in these large bungalows, before the inevitable process of dissolution of joint families created the division and sub-division of these huge properties. 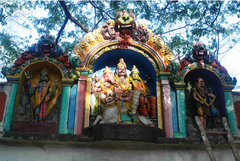 The Malleswaram locality is about 117 years old and the Kaadu Malleswara temple much older. It is indeed interesting to see the cycle of big bungalows and garden properties converted to the crowded locality it is fast becoming today. Malleswaram's history boasts of cultural icons who lived and practices in its locale. They come from various art disciplines including legends like Venkatappa, Veena Doraiswamy Iyengar, Krishnawamy, G. P. Rajaratnam and T.A.S. Mani. This old locality also has several religious centers like the St. Peters Seminary and at least 3 different Mutts and beautiful old temples including the Ganesha Temple, Krishna Temple and Grace Church. Education especially for women has been one of the major areas of interest and schools such as Mysore Education Society (MES), Malleswaram Ladies Association (MLA), Government Girls School and Cluny Convent were built to encourage them. NGO's and social service organisations like Seva Sadan, Crafts Council of Karnataka and Malleswaram Entrepreneurial Women's Society (MEWS) were founded and sustain their activities here too. In fact, even to this day, Malleswaram has remained a hub of creative and cultural activities. With several schools of classical Indian dance be it Bharatanatyam or Kathak, percussion schools, auditoriums and galleries promoting the arts, to more recent art groups like Bar 1 and Guruskool, Malleswaram seems to have its heart set - then and now - on Culture. 15:30 Commence walk past Padmini Ravi's studio, Venkatappa & G P Rajaratnam residences and hear about their contributions. A fairly large group of participants assembled at the main entrance of St. Peter’s Seminary at 3pm on Saturday 28 Feb 2009 given some confusion over the location of the Seminary and which entrance, as it turned out to have three! (an oversight). The event commenced with a short introduction to Bangalore City Project, past events and a brief introduction to the area by Krupa Rajangam, UDBHAVA volunteer. Pankaj Modi, Sonalika Dugar, both also UDBHAVA volunteers and Krupa, were the guides for the day. Father Abraham, the Vice Rector of the Seminary welcomed the group to the Seminary, spoke about its history and led the group around the original building, an impressive colonial style structure with colonnades verandahs all around. 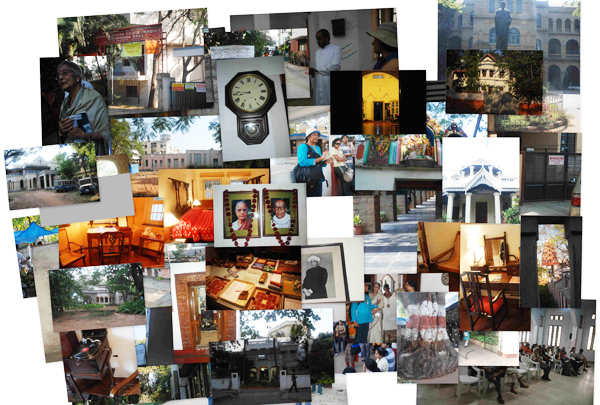 The group walked through the vast campus to the administrative block where they were shown a short film on the history of the place, its origins in Pondicherry and some old photographs. Pankaj, Sonalika and Krupa then led the participants down 8th main and onto 18th cross, to walk by K.Venkatappa’s House. 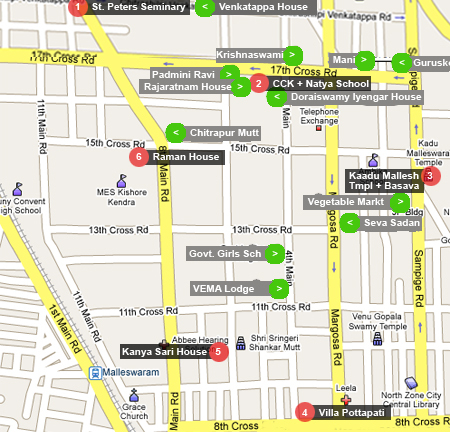 (18th cross has been renamed Chitrashilpi Venkatappa road in his honour). 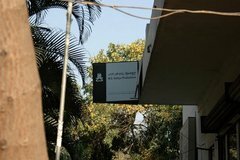 Then onto 17th cross past Padmini Ravi’s studio, Rajarathnam house and into the M.E.W.S (Malleshwaram Entrpreneurial Womens’ Society) building which also houses the Crafts Council of Karntaka and M.S.Sathyu’s studio. The group took a short shopping break :) before moving onto Kadu Malleshwara Temple on 15th cross. They were led past Veena Doraiswamy Iyengar’s house next door to MEWS, M.L.Krishnaswamy’s house diagonally opposite Doraiswamy Iyengar’s and past T.A.S.Mani’s residence. On the way the group stopped at a wayside shrine to hear about the planning of Malleshwaram and the importance given to sanitation resulting in the laying of conservancy lanes, which still remain though altered from their original form. The walk continued, with the group continuing past Malleshwaram Market and Seva Sadan before heading south at Government Girl’s High School. After a brief stop to admire Vema Lodge they finally landed at Villa Pottipatti,and took a most welcome break from all the walking and listening! They were served refreshments; courtesy Neemrana Group of Hotels and small batches were invited to view the rooms of the heritage hotel to appreciate the sensitive adaptation of an old bungalow to a new use. The group moved on to Kanya rather reluctantly but were rewarded by the presence of both Vimala Rangachar and Pramila Prasad, who spoke about the role of their family in the history of Malleshwaram. The event wound up at Sir Raman House where Mrs Kausalya Ramaseshan, Sir Raman’s niece by marriage, held everyone engaged with her reminisces of life in the house of Sir and Lady Raman. Dayaprasad Kulkarni, BCP member, was once again the ‘official’ :) event photographer. All in all a successful event given all the worry over whether to conduct the event or not in the first place as the date coincided with the anti-terroism rally planned that day in the nearby Palace grounds. A few residents of Malleshwaram joined the group and it was enjoyable to hear them share their experiences and memories with everyone. About half a dozen posters with route map and details of each stop were circulated among the group to ensure that everyone would know where we were going next and what was significant about the place. This was based on past feedback that some people missed out on what the volunteers were saying as either the group was too large or the volunteers weren’t audible enough. Feedback forms were again circulated through the group inviting their comments on the area they were led through. 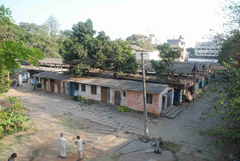 The earliest extensions to the old city were Chamarajpet and Seshadripuram (1892). Malleshwaram and Basavanagudi though planned as early as 1892 were only executed in 1898 ‘with some urgency’ due to the intensity of the plague epidemics. 291 acres were acquired for Malleshwaram. It was promoted as a ‘model hygienic suburb’ well spaced and so well drained that ‘a deluge of six inches would not leave a vestige of standing water in any of the house sites’. (A guide to Bangalore and Mysore Directory, 1905 quoted Janaki Nair, 2005). Within these new extensions the planning authorities paid attention to social hierarchies so Malleshwaram had eight blocks, one for each ‘particular section of the people’ similar to Basavangudi (A guide to Bangalore and Mysore Directory, 1905 quoted Janaki Nair, 2005). Sri Venkatranga Iyengar, is credited with the founding of Malleshwaram. He loved riding and one day visited and liked the Malleswara temple. He envisioned a locality of noblemen who would lead a rich and cultured life around the temple. He made his vision a reality as he was connected to the Bangalore Municipality. He invited the Patankars, who are descendents of the Divans of Mysore as also Diwan Sheshadri Iyer and Diwan Krishnamurthy to stay here. These rich noblemen bought big properties of about 2-3 acres size and chose to retire here. Thus Malleswaram quickly became an area where erstwhile busy rich and civic minded people decided to spend the last years of their lives engaged in various social and cultural efforts. 2-3 generations of their families lived here before the inevitable process of dissolution of joint families created the division and sub-division of these huge properties. 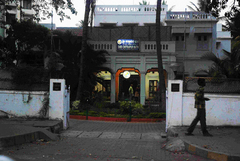 This 230-year-old pontifical institute started by French missionaries in Pondicherry. It was transferred to Bangalore in 1934. It is an autonomous university recognised by the Vatican. There are other institutes affiliated to it, and it confers doctoral degrees. The missionaries retained control till 1964 when it was handed to Indian bishops. Bangalore was selected as the site due to its salubrious climate. 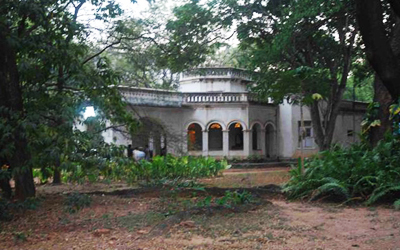 The structure sits in 30 acres of land, which was granted by the Maharaja of Mysore. During World War II the building was requisitioned by the government and used as a military hospital. Born in 1886/1887 – 1965 to a family of court painters Venkatappa soon became one of the most prominent artists in the Mysore state. 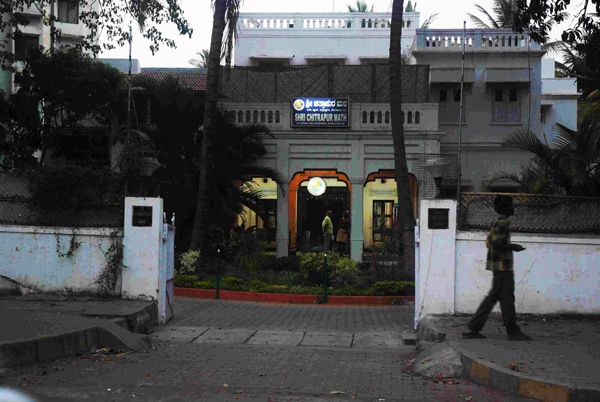 The Venkatappa Art Gallery on Kasturba Road was a tribute to this great painter. His works are exhibited in the ground floor of the gallery. The gallery also preserves the books and other personal material used by the great artist. The Crafts Council of Karnataka's (CCK) established in 1967 is dedicated to helping the Indian crafts persons sustain their art by actively engaging with them and providing them with support in terms of product development and retailing. Their aim is not just to preserve the rich heritage of Indian handicrafts and hand looms, but also to revive dying crafts traditions by working with talented and dedicated designers who develop new interpretations so that they become relevant and self-sustaining in modern society. They work directly with the crafts people and provide them with a forum where they can seek assistance along the entire process from learning the required skills, to product development and retailing. They are a NGO and work with the Govt. 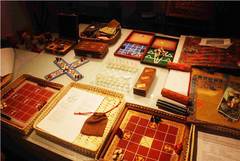 of India and the Directorate of Handicrafts towards achieving our goals. 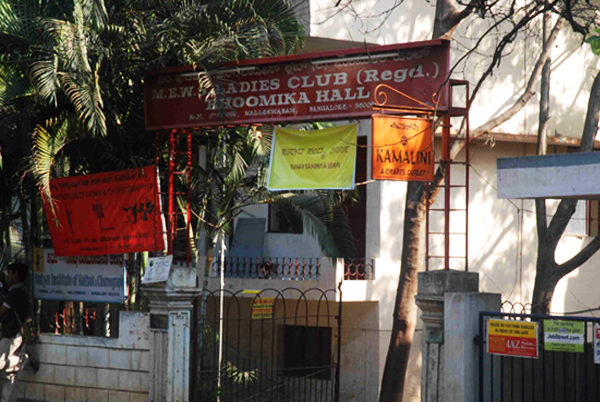 The building was originally planned as a hostel for working women / girls – M.E.W.S - set up by Ammani Iyengar daughter in law of Venkataranga Iyengar, one of the founders of Malleshwaram. Born 1930, leading film director, art director and stage designer. Recipient of the Padma Shri. Doreswamy Iyengar, generally known as Mysore V. Doreswamy Iyengar (1920 - 1997), was a famous Carnatic Musician and an exponent of the Veena. Born into a family of musicians, his father, Venkatesha Iyengar, was himself a Vainika and a musician in the court of the Maharaja of Mysore. He gave his first public performance in 1943, in the Bangalore Gayana Samaja. He studied his Bachelors in the Maharaja’s College in Mysore. He was he music director of the All India Radio in Bangalore. The concerts of Doreswamy Iyengar accompanied by T Chowdiah on the violin became very popular. This famous filmmaker studied at Maharaja’s college. His wife Srirangamma was the first women graduate from the Mysore State University. With his work on Viaggio in Italia, he became the first Indian to assist legendary Italian filmmaker Roberto Rossellini on the sets. Ingrid Bergman and George Sanders starred in this film. He is probably the only one from the Mysore state who went to Paris, London and Rome in the late 1940s to study film direction. Later he made a docoumentary on the life of Sir M Vishvesvaraya and a biography on Doraiswamy Iyengar. He was probably the only one from Karnataka who had such a major presence in the country’s film institutions like the Films Division, the National Films Development Corporation, the Censor Board, the national film awards jury, the Film and TV Institute. Relatively less known from among the towering members of the ‘Mysore Generation,’ which includes Kannada icon Kuvempu, essayist Murthy Rao, writer Rajaratnam, philosopher Hiryanna, advisor to Indian prime ministers H Y Sharada Prasad, English professor C D Narasimhaiah, scholar T N Srikantaiah, cartoonist R K Laxman, novelist R K Narayan and photojournalist T S Satyan. Composer, percussionist and world-renowned maestro, T.A.S. Mani is from Bangalore. He is a maestro of South Indian percussion music and especially the Mridangam. 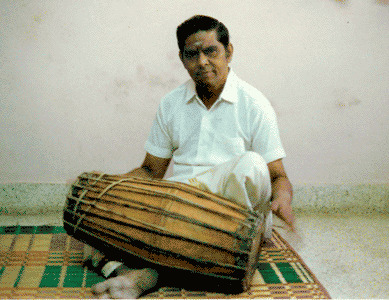 He is the president of Karntaka College of Percussion (Bangalore, India) which he founded in 1975. He trains musicians from India and abroad. Rama Mani, his wife, is a great Carnatic Classical singer and renowned in her own right. They live in Malleswaram and have a son, Kartik Mani who is exploring fusion and Western styles of percussion. 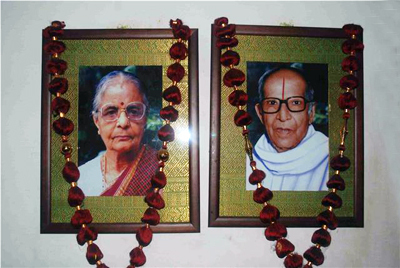 Founded by Gopal and Geetha Navale, both musicians. Gopal plays the mandolin, flute and guitar and Geetha the veena. They also play for Esperanto, a world music group. Together with Siddhartha and Micheal Sorenson they organise the Feedom Jam concerts. This monthly event is a free platfrom for musicians and artists to play to an interested audience and has been running for more than 15 years now. They also host a big annual event that brings together the contemporary music community. This ancient temple existed even before the Malleswaram locality was built. Dedicated to Malleswara – Esawar, this Shaivite temple is still in use today. In fact, recently people who were constructing a building opposite the temple, discovered an older annex – a tank with a Basava sculpture spouting water. 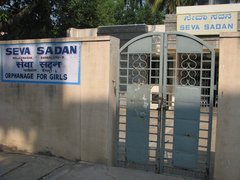 A girls orphanage founded by Smt. Rajivibhai Shivarao and Devi Loakasundari Raman, wife of C. V. Raman in 1936. It is rated as one of the best orphanages in the state. Mrs. Rangachar the great-grandaughter of the Venkataranga Iyengar, one of the founders of the locality, has served the institute for over 60 years and is now the President. She was instrumental in setting up the auditorium to encourage performing arts. 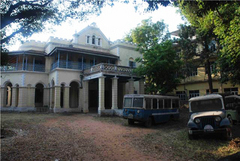 Once his private residence this stone bungalow was donated by Diwan Nanjundiah to the government in 1948 so that it would be a school for girls. 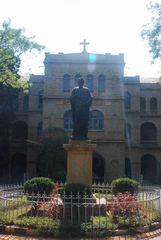 It now also houses a girls college. 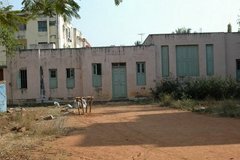 Part of the compound has been given over to hold an auditorium constructed and maintained by the Rotary Club of Bangalore North. Vema Lodge, bought and owned by the daughter of Diwan Sir P N Krishnamurthy, is one of the few original structures that are still standing today. It continues to remain in the family and is now owned by his descendants. In fact, Mr. V. Pramod one of the great-great grandsons of this famous Diwan resides here with his family. This beautiful old bungalow displays all the architectural characteristics of its era including the original red-oxide floor, gabled roof-fronting, a cast-iron pillared drive-way and a raised pillared veranda surrounding the house. This saree boutique was founded by Ammani Iyengar in 1930 and is now run by her daughter-in-law Pramila Prasad. Smt. Ammani Iyengar, a lady with keen business acumen, started a chit fund to enable the women in the neighbourhood to purchase her Kanjeevaram sarees. She had her looms in Kanchipuram and designed them herself. The 110+ year old house in which this boutique is run, was originally the coach house to the property that belonged to her father-in-law Venkatranga Iyengar, one of the founders of Malleswaram. 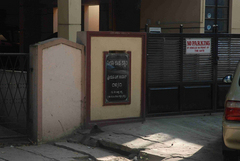 Her son Mr. S R Krishna Prasad continues to live here with his family. 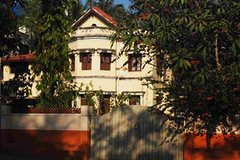 Malleswaram has a number of religious and educational institutions. 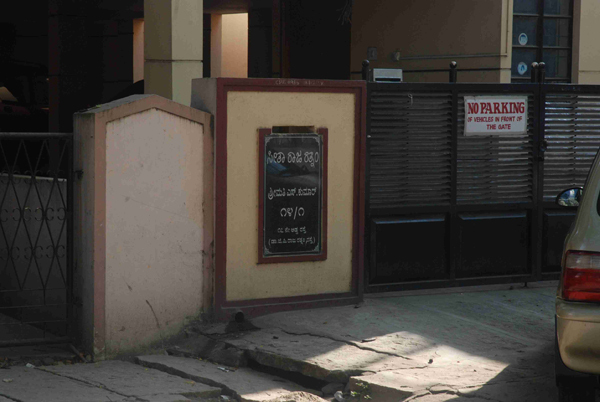 Mutts are hindu institutions that preach and offer civic services to their community. Malleswarm has 3 important Mutts – the Yathiraj Mutt, the Chitrapur Mutt and the Shringeri Mutt. Chandrasekara Venkata Raman, was born in Trichi, TN on November 7, 1888. He was the second child of Chandrasekhar Iyer and Parvathi Ammal. His father was a professor of mathematics. At eleven, he finished his secondary school education and when he was fifteen, he finished at the head of the class to receive B.A. with honors in Physics and English. In 1907, barely seventeen, Raman again graduated at the top of his class and received his M.A. with honors. In the same year he married Lokasundari. In 1917, with his scientific standing established in India, Raman was offered the position of Sir Taraknath Palit Professorship of Physics at Calcutta university, where he stayed for the next fifteen years. During his tenure there, he received world wide recognition for his work in optics and scattering of light. He was elected to the Royal Society of London in 1924 and the British made him a knight of the British Empire in 1929. The following year he was honored with the prestigious Hughes medal from the Royal Society. In 1930, for the first time in its history, an Indian scholar, educated entirely in India has received the highest honor in science, the Nobel Prize in Physics. In 1934, Raman became the director of the newly established Indian Institute of Sciences in Bangalore, where two years later he continued as a professor of physics. In 1947, he was appointed as the first National Professor by the new government of Independent India. He retired from the Indian Institute in 1948 and a year later he established the Raman Research Institute in Bangalore, served as its director and remained active there until his death on November 21, 1970, at the age of eighty two. Raman was honored with the highest award, the "Bharat Ratna"(Jewel of India), by the Government of India. The growth is both quantitative and qualitative. 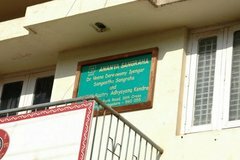 In its infant stages the college was housed in a small dwelling Anandashram, which recalled the ancient Guru Kula system with a good rapport between the small number of students and their teachers. 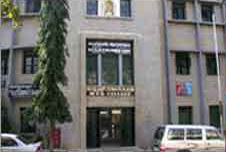 From this humble beginning the college has grown gradually into a full-fledged college. The college is now a four-storyed stone structure with an annex as well. In 1962 courses in Science started. In the course of its historical development M.E.S College has acquired great prominence not only in Karnataka but also in the country. Its aim has always been to provide value based education at affordable cost and to strive for the cultural growth of the student.